As a book of scripture, the Bhagavadgita has assumed a position of universal interest. Its teachings have gained appreciation not only in India, but far beyond its borders. I Our Gita-Library alone has about 1400 editions of the Bhagavadgita published in 34 different languages including 8 foreign languages. 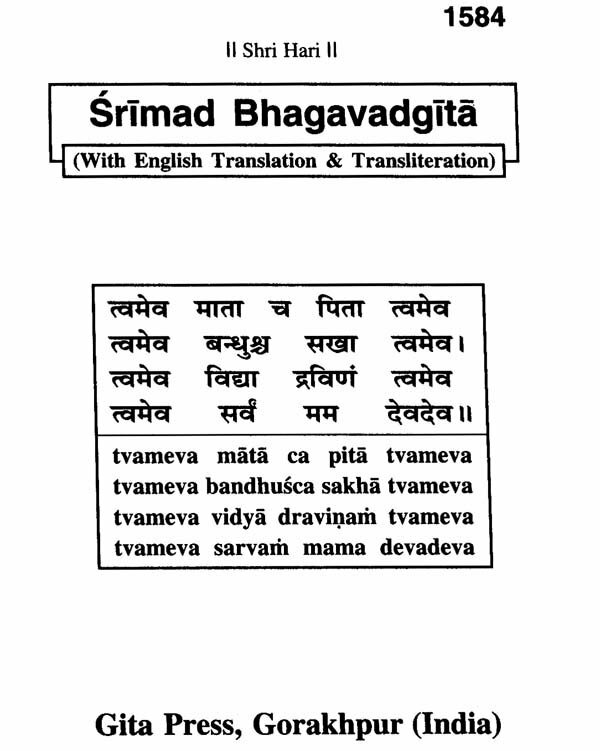 We are bringing out this edition of the Gita in pocket-size with simple English translation and Roman transliteration of each verse and in a popular form. We trust it will find favour with the English-reading public. We have also published two editions of this book in bolder types in book size for convenience of readers. 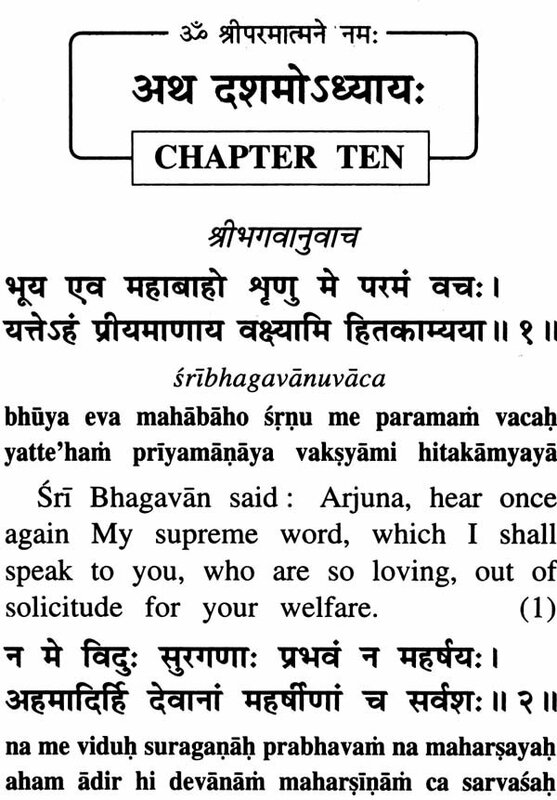 The English translation of this edition has been based on the Hindi rendering of the Gita made by Syt. Jayadayal Goyandka and appearing in the Gita- Tattva Number of the Hindi monthly 'Kalyan', published by us. In preparing the present English translation, the translators have made use, every now and then, of other English translations of the Gita, and we express our grateful acknowledgement for the same. In order to add to the utility of this small volume an introduction by Syt. 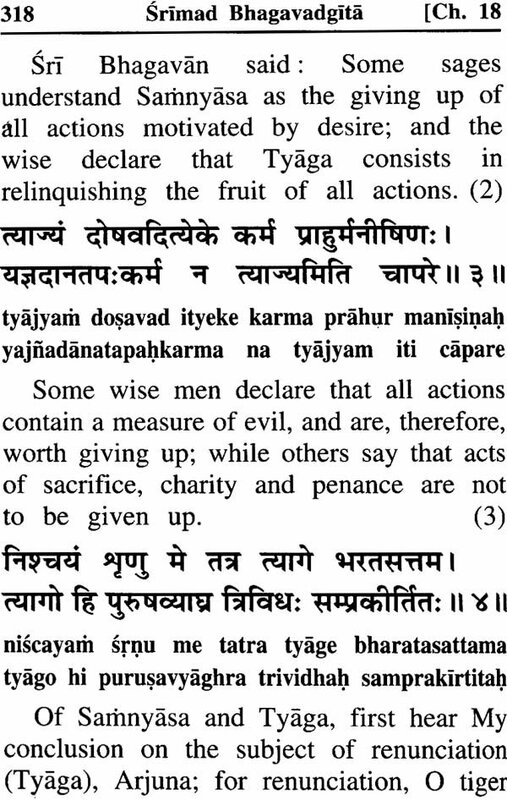 Jayadayal Goyandka and a synopsis of the Gita have been prefixed to the translation. Several Editions of Gita in Sanskrit, Hindi and other Indian regional languages have been published by us. In English too, several other editions including some with detailed commentary have also been published for in depth study. "Sankhyayoga, or the Yoga of Knowledge"
"Karmayoga, or the Yoga of Action"
"The Yoga of Knowledge as well as the disciplines of Action and Knowledge"
"The Yoga of Action and Knowledge"
''The Yoga of Jnana (Knowledge of Nirguna Brahma) and Vijoana (Knowledge of Manifest Divinity)"
''The Yoga of the Indestructible Brahma"
"The Yoga of the Sovereign Science and the Sovereign Secret." "The Yoga of Divine Glories"
''The Yoga of the Vision of the Universal Form"
"The Yoga of Discrimination between the Field and the Knower of the Field"
"The Yoga of Classification of the three Gunas"
Chapter XVI entitled "The Yoga of Discrimination between the Divine and the Demoniacal Properties"
"The Yoga of Classification of the Threefold Faith"
Yoga of Liberation through the Path Knowledge and Self-Surrender"